* James White's 2015 Article: Six months later, James White wrote yet another article on this and as previously, he again failed to quote himself or R.C. Sproul Jr. in his defense of what they wrote. (A listener of both the BEL and Wretched talk shows had written Wretched's Todd Friel in January 2015 to ask him to urge his friend James White to retract his heretical denial of God the Son's two natures. Friel did forward the issue on to White, but insisted that there was nothing of this issue remaining to be answered.) However, on James White's Jan. 22, 2015 Facebook post, after initially blocking Enyart's question, Dr. White left this unanswered: "James White, do you affirm that the Second Person of the Trinity has both a divine and a human nature?" See our official White vs. Enyart web page for the "Shocking Debate Aftermath" details or to watch the full debate. 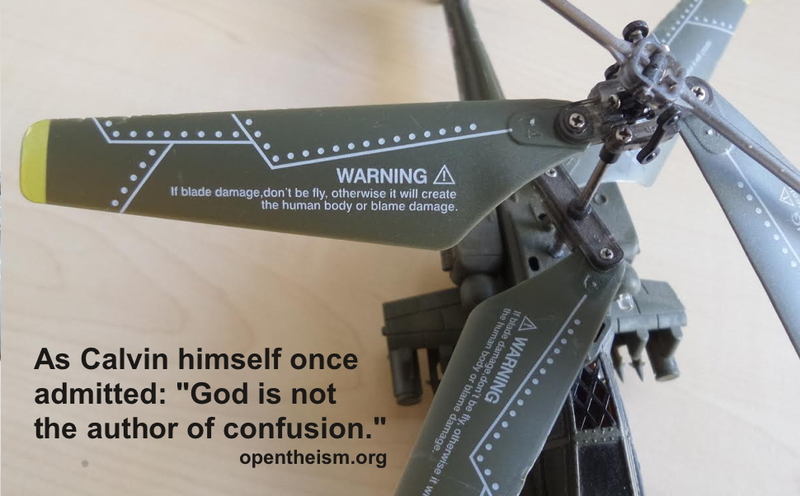 Is Open Theism a Proper Representation of the God of Scripture? Will Duffy vs. Matt Slick, founder of carm.org. Is the Future Settled or Open? Samuel Lamerson vs. Bob Enyart. Dr. Lamerson is professor of New Testament and interim president of Knox Theological Seminary which was founded by the late D. James Kennedy. Since 1991 Pastor Bob Enyart of Denver Bible Church has hosted a daily talk radio program. James White vs. Bob Enyart -- Open Theism: Is the Future Settled or Open? The OpenTheism.org team organized the July 8, 2014 debate between leading reformed theologian James White and OT proponent Pastor Bob Enyart held before a live audience in downtown Denver's historic Brown Palace hotel. Chris Fisher Debates a Calvinist on God’s ability to deceive, the nature of Jesus, and prophecy. God is Open Aurora Colorado's Calvary Chapel pastor Ed Taylor and DBC pastor Bob Enyart informally debate on the radio about God being eternally free, inexhaustibly creative, and able to have new thoughts. Will Duffy debates an Arminian Pastor Jaltus on the freedom that God had before creation. Open Theism Debate The North American Reformed Seminary (TNARS) president Dr. Larry Bray vs. Colorado pastor Bob Enyart. See also the open theism debates in the Journal of the Evangelical Theological Society. Is Calvinism Biblical? debate between TNARS president Dr. Larry Bray vs. Bob Enyart which is hosted at TheologyOnline.com, the official forum of OpenTheism.org. CARM's Matt Slick vs street preacher Jesse Morrell on The Great Calvinism Debate: Free Will or Unconditional Election. Slick is the Calvinist director of CARM, the Christian Apologetics and Research Ministry. - The broadcast event, Liberty University's associate professor Dr. Richard Holland on God, Time and the Incarnation! - Will Duffy on Denver radio discussing the film Calvinist and John Calvin Institutes, Book 1, Chapter 18. In Passing: For those who have been told that everything occurs by God's eternal decree, thus making Him the author of every thought and word, consider the following toy made in China, along with 1 Cor. 14:33 which states that, "God is not the author of confusion..."